As you might have seen, I won 16 polishes from From Head To Foot, and Martina also included 2 more because she is sweet. So I have 18 international pretties to try out! I'll start with my favorite so far. Catrice - Sold Out Forever. Pure awesome light green with very subtle green shimmer. 3 coats. This is supposed to be a dupe for Chanel's Jade, so this polish got really popular and I think it is somewhat hard to find now. I loooove it. And I tried to find a dupe in my stash but I don't have anything quite like it! Essie - Turquoise and Caicos, OPI - Mermaids Tears, Catrice - Sold Out Forever, China Glaze - Re-Fresh Mint, Sinful Colors - Mint Apple. Nothing even very close! Sold Out Forever is a true apple green, Re-Fresh Mint is green but much lighter, while all the others are somewhat blue-toned. This is Essence - All Access from the Multi Dimension line. Really pretty shimmery deep green. 2 coats. I really like this one too. I seem to always like greens. Essence - Meet Me At The Club from the Sun Club collection. These polishes are scented and this one smells terrible, haha. The scent is overwhelming, and I'm not normally bothered by scents. It smells like faux-blueberries. Like blueberry lipgloss but WAY stronger. 3 coats. Apart from the smell, this polish is gorgeous, but my camera did NOT like it AT ALL. I'm going to do something I've never done before and include a photo from google because I just could not get it myself. 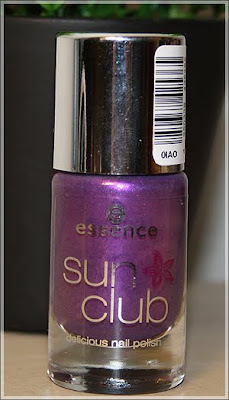 I think it might be similar to China Glaze - Senorita Bonita but not quite as shimmery. This is p2 Color Victim - Attraction. Pretty pink with violet microshimmer! For some reason I love the bottle. 2 coats but pictures show that I could have used a third. A bit sheer - 3 coats. Hema - 18. This one is not very "me." I haven't tried out all the polishes yet, but I'm pretty sure this is the only one I don't like. Mauve with gold shimmer. It's sheer - 3 coats and still sort of see-through. However, it looks cool over black! There you have it - the first 6 of my international goodies from Martina. Beautiful!! OMG you won a Nfu Oh I thought you would have swatched that one first. What Nfu oh is it? wow!! these are beautiful!! i really like the bottle of Jip en Janneke. All of them look sooo pretty to me! And omgosh that last one over black looks awesome! Was not expecting that! Love that first green-so pretty! Lucky you! These are all gorgeous! Jip and Janneke are the characters on the bottle. It's also from the Hema.